… just came up on this blog. Since I last reported on the crowds of spam comments here, in my 10/20/18 posting “Numbers and names” (“The number of pieces of comments spam on this blog … passed 5.5 million a little while ago”). Well, on the 3rd, when I first checked, some 5,600,601 had accumulated since this blog started in December 2008. At the moment, there’s an attack underway from a site with a clever strategy for evading spam recognition programs, so I’m getting more than a thousand new spam comments a day.. Meanwhile, there’s a certain amount of entertainment in the ebbs and flows in the views of postings on this blog — which will lead me eventually to some remarks on location expressions in the world’s language. On peppernuts. 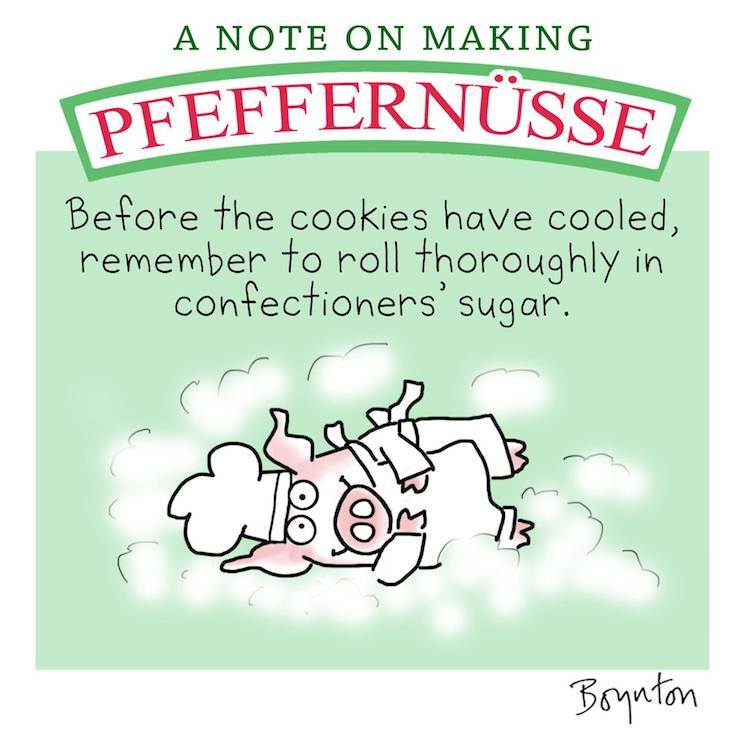 And on the recipe register (here: Recipe Object Omission in roll thoroughly in confectioners’ sugar). 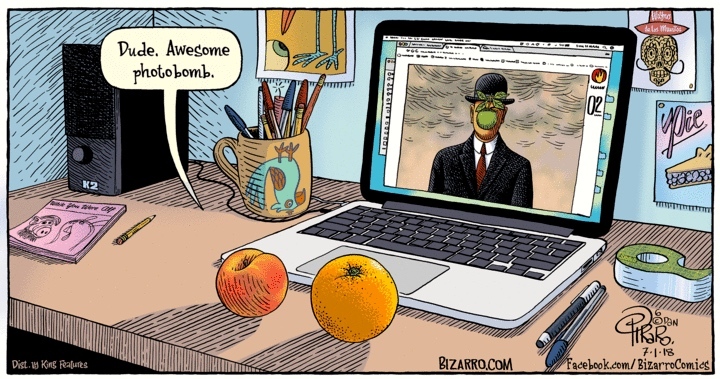 From the point of view of the peach and the orange, the image on the screen (Magritte’s painting “Son of Man”) is a photobombing of a portrait of a conventionally dressed bowler-hatted man (Magritte himself, it seems). A green apple appears unexpectedly in the portrait, in this case, interfering with and obscuring the portrait’s central image. In photobombing, the unexpected element may appear in the field of view unintentionally — irrelevant but noticeable things just happen to be caught in the scene — but it can be intentional — the unexpected element has been deliberately inserted into the scene by someone, as a prank. Only rarely does the unexpected element obscure the central image in the scene. So from the point of view of the fruit, Magritte’s image is doubly awesome: it’s intentional (the work of a prankster, but who? why not the apple itself, acting on its own! ); and it conceals the identity of the portrait’s subject (as in other bowler-hat paintings by the artist), thus subverting the idea of portraiture itself, while making a piece of fruit the actual focus of the work. Fruut Rulz. This says to me (nonsensically) that if you’re eating whole grains now, you should switch to refined ones. The news story quote has swap NEW for OLD, but Lighter expects swap to have the argument structure swap OLD for NEW. And OLD for NEW in fact is the argument structure in NOAD‘s entry for swap. The example has several features of note, but especially its nominalized form: substitution of OLD for NEW. This is of course exactly what you’d expect from speakers for whom reversed substitute is perfectly normal, but I didn’t have such an example in my files. Needless to say, he was leaving OUT the raisins and ADDING chocolate chips. Also needless to say, this is British English. This is reversed SUBSTITUTE: substitute OLD for NEW (in this case, substitute customary raisins for milk chocolate chips — customary lets us know that the raisins are OLD), rather than traditional SUBSTITUTE: substitute NEW for OLD (what would be, in this case, substitute milk chocolate chips for customary raisins). The end of our discussion was David’s noting that the shift from traditional to reversed SUBSTITUTE seems to be virtually complete for many British speakers (including educated ones), and Larry’s suggesting that this was true for some younger American speakers as well. Another ship of linguistic change that has reached its port for many speakers. Two other such ships I’ve written about: NomCoordObjs (nominative coordinate objects, as in They gave it to Kim and I, rather than to Kim and me; and +of EDM (exceptional degree marking with of, as in that big of a dog, rather than that big a dog). You are currently browsing the archives for the Argument structure category.